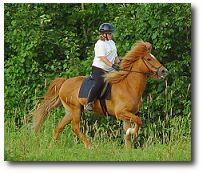 Víkingur was a very large, handsome four gaited chestnut gelding with a thick, flowing flaxen mane and tail. 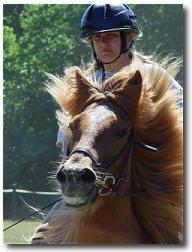 He was a competition horse in Iceland and had good success in Tolt and Four Gait competition. His specialty was his fast tolt which was as fast as some horses can gallop! He was an extremely sensitive and intelligent soul. 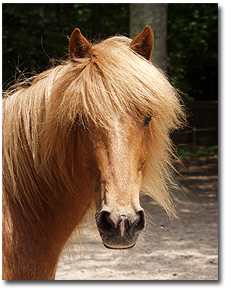 He was a one person horse, and had a sweet special character. Although, a large, extremely sensitive and powerful Icelandic and a short, timid rider seem like a very unlikely combination, Andrea and Víkingur formed great partnership and a special bond. 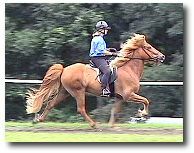 Víkingur was Andrea's main riding horse for many years. Together they competed in Icelandic sport competition, hunter paces, trail trials, gymkhanas, and many other events as well as spending many hours out on the trail. On the farm Víkingur was a fixture - there from almost the very beginning. For about 18 years he was the "special one" - and he knew it. Sand Meadow just isn't the same without him.